Many children learn to cook from their parents from stained, handwritten recipes handed down through generations. But if your mom and dad were more hopeless than helpful in the kitchen, chances are you relied more on frozen dinners than home-cooked meals and never picked up the timeless skills you need to, you know, feed yourself. Luckily, you can easily go from novice to expert with the help of websites and apps designed to make cooking as simple as finding a recipe on Pinterest and watching a YouTube video on technique. Cooking experts like Jamie Simon and Mark Bittman regularly post videos that demonstrate everything from basic cooking skills to elaborate steak dinners. In September, San Francisco chef Michael Mina launched Cook Taste Eat, where he posts recipes for a full meal (including appetizer, entrée, and sides) and step-by-step videos showing how to make each recipe. It's worth noting that Mina’s recipes are designed with a more advanced cook in mind (unless a beginner wants the challenge of attempting sesame-crusted ahi tuna and fava bean falafel in which case, kudos). The rest of us will be comforted by more basic, and widely available, tutorials. Epicurious for iOS and Android offers the master class in cooking with categories ranging from holidays to method of cooking (grilling, braising, roasting). You can also search recipes by experience level (“I can cook like a pro” or “I can barely cook” are two options), as well as by ingredient. 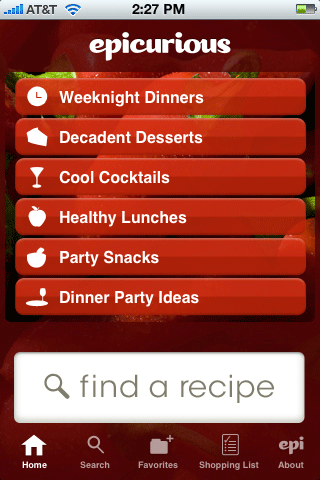 The app will turn up top-rated recipes featuring the items you have on hand from publications such as Bon Appetit and Gourmet. The Big Oven app for iOS, Android, and Kindle Fire is also a veritable encyclopedia of recipes, with more than 250,000 to choose from. If you’re looking for an app that goes beyond recipes (though Epicurious’ recipes are beyond reproach), then pony up $9.99 for Mark Bittman’s How to Cook Everything iOS app. Bittman, a columnist for the New York Times and author of cooking bibles How to Cook Everything and How to Cook Everything Vegetarian, has packaged the recipes and techniques you know and love from his books (everything from how to make pizza dough to proper ways to use a knife) in one handy app. For those of us who own Bittman’s hefty tomes, the app is a much lighter way to channel his cooking wisdom. And if you’re more of a creative type than a mathematician, Kitchen Calculator is the way to go; the iPhone app converts measurements and scales your recipes down (or up). Technology has democratized the art of cooking, heretofore the territory of chefs trained in French culinary schools. While home cooks may not know the finer points of molecular gastronomy, the rise of food blogs has given way to crowdsourcing—in other words, turning to our peers to learn how to cook. There are blogs that provide insight on food, how it grows, how best to cook it, and how to cook seasonally (squashes in fall, asparagus in spring). When you have a connection with the ingredients and know more about them, it’s easier to cook intuitively. In the first story of our Better Eating Through Technology series, I linked to The Kitchn, which is a daily read for new recipes, techniques, and food photos. The vegetarian blogs Green Kitchen Stories (which spawned a nice iOS app) and Cookie and Kate are also favorites. If perusing food blogs isn’t your thing, then turn to the crowd. Earlier this year, iOS app Snapguide launched with user-submitted guides on topics ranging from jewelry-making and tech hacks to DIY clothing and, of course, cooking. The guides include pictorials that walk you through even the simplest recipes (chicken buffalo wraps with frozen chicken tenders, premade dressing and a microwave, anyone?). The majority of Snapguide’s how-to guides are at least resourceful, if not exactly sophisticated. Then there’s the site that unites food lovers with food makers. Cook it for Us lets “cravers” select online recipes that “makers” then sign up to cook and deliver to them. If you crave something, you have to recruit others to sign on and crave it too, otherwise makers won’t bother cooking it (like Groupon for cooking, basically). The site lets you know when your food is being made, your PayPal account is charged, and food is delivered to your door. Cook it for Us shouldn’t be mistaken for a meal delivery service—if the most craved items are cookies and pasta, then that’s pretty much all you’ll get—but it is a nice service if you crave complicated meals you don’t feel like cooking. But hey, with these tools, you could give it a shot.